Atilla was one of nine co-defendants in the case but was the only one to be tried before U.S. District Judge Richard M. Berman., and Atilla was found guilty on five of six counts, the New York Times reports. Seven of the co-defendants remain at large, but one of them, Reza Zarrab, pleaded guilty and testified for the prosecution, implicating Turkish President Recep Tayyip Erdogan and helping prove Atilla guilty. "For years, Mehmet Hakan Atilla conspired to use the American financial system to conduct millions of dollars’ worth of illegal transactions on behalf of the Government of Iran," Acting Assistant Attorney General for National Security Dana Boente said in a Justice Department statement. "He used his high rank at a Turkish bank to disguise the transactions as humanitarian food payments and deceive American officials, but now, after receiving due process of law, he has been held accountable in court, by an impartial jury." "This successful prosecution is another example of our resolve to pursue and bring to justice those who violate our sanctions and other laws that protect our national security," he added. 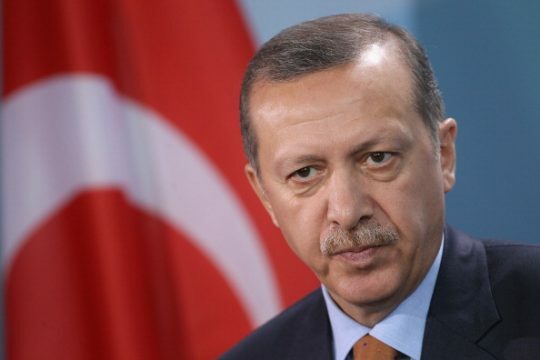 Erdogan denounced the U.S. case and registered his complaints with President Donald Trump, but the prosecution continued in spite of those protestations. Zarrab testified at the trial that Erdogan had ordered the transactions go forward. Acting U.S. Attorney Joon H. Kim contradicted Turkish criticism of the prosecution, saying that the trial was fair and proved a conspiracy to violate sanctions under the International Emergency Economic Powers Act (IEEPA). "Today, after a full, fair, and open trial, a unanimous jury convicted Hakan Atilla, a senior banker at Halk Bank," Kim said. "Along with the prior guilty plea of Reza Zarrab, two men at the heart of this massive and brazen scheme that blew a billion-dollar hole in the Iran sanctions regime now stand convicted of serious federal crimes." "Foreign banks and bankers have a choice: You can choose willfully to help Iran and other sanctioned nations evade U.S. law, or you can choose to be part of the international banking community transacting in U.S. dollars. But you can’t do both," Kim added. Atilla was convicted not just for conspiring to violate sanctions, but also to defraud the United States and to commit bank fraud and money laundering. The bank fraud counts of which Atilla was found guilty both carry a maximum sentence of 30 years in prison, while the other counts carry penalties ranging from five to 20 years. "Atilla was convicted of conspiracies to defraud the United States, to violate the IEEPA, to commit bank fraud and to commit money laundering, as well as a substantive count of bank fraud," the department said. Atilla’s sentencing is scheduled for April 11, while Zarrab’s date is not yet planned. This entry was posted in Uncategorized and tagged Department of Justice, Iran, Recep Tayyip Erdogan, Turkey. Bookmark the permalink.